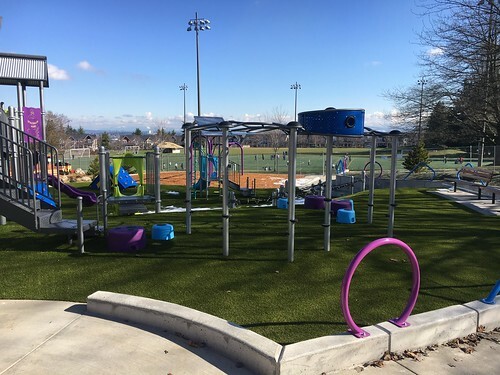 Seattle Parks and Recreation invites the community to the third and final public meeting for the Mount Baker Play Area renovation project. The open house is Thursday, Oct. 2, 2014, 4:30 to 6:30 p.m., at Mount Baker Park, 2521 Lake Park Dr. S, near the play area. At this meeting, the Parks landscape architect and planner for the project will present the preferred design for the play area and gather community feedback on the final features for the renovation. In the case of inclement weather the meeting will be held at the Mt. Baker Community Clubhouse, 2811 Mt. Rainier Dr. S.
The renovation project will replace play equipment, provide access improvements and improve other features at the park. 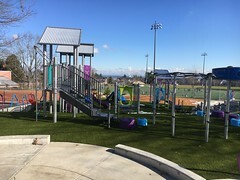 The project also brings the play area into compliance with current play area safety standards and meets the requirement of the Americans with Disabilities Act (ADA). For more information about the project and notes from previous meetings please visit http://www.seattle.gov/parks/projects/mt_baker/. Funding for this park improvement is provided by the King County 2013 Park Levy. For special meeting accommodations or for more information about the project please contact Jeron A. Gates, Seattle Parks and Recreation, at 206-684-0998 or jeron.gates@seattle.gov. Seattle Parks and Recreation invites the community to an informational meeting about the upcoming demolition and restoration of property donated to the City of Seattle in the Gatewood neighborhood of West Seattle. The meeting will be held on Saturday, August 16, 2014 from 10 to 11:30 a.m. at the donated Watton property, 3823 SW Willow St, Seattle 98126 in West Seattle. Parks received the Watton property and funding to demolish the house as a reserved life estate donation from George and DeLayne Watton in 1999. Parks is working to complete the permitting for the house demolition and anticipates demolition work will occur on September 15, 2014 with restoration of the site and establishment of turf to be completed by April 2015. Parks will work with the contractor to minimize the impact to the neighborhood during this work. For more information about the property please visit: http://www.seattle.gov/parks/projects/watton/. For special meeting accommodations or for more information about the project please contact Patrick Donohue, Seattle Parks and Recreation, at 206-684-9286 or patrick.donohue@seattle.gov. Seattle Parks and Recreation is cancelling the June 26 meeting for the Yesler Park project and rescheduling it for August 28 at the Yesler Community Center. This is the second in a series of three public design workshops. At the meeting in August, the community will be asked to review park design options and provide feedback. 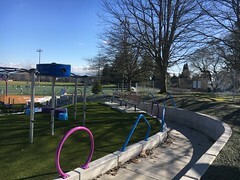 The new 1.7-acre park is part of the redevelopment at Yesler Terrace. The park will serve as a gathering place for current and future residents of the Yesler, First Hill and other surrounding neighborhoods. The Parks and Green Spaces Levy allocates $3 million for planning, design and construction of the park and the Office of Arts and Culture will allocate a $130,000 art budget from 1% for the Arts program. The community is encouraged to be part of the process and provide input on the project. Interpreters will be available at the meeting in August for people who speak Somali, Vietnamese, Amharic, Oromo, Tigrinya and Cantonese. Yesler Community Center is located at 917 E. Yesler Way, Seattle WA 98122. 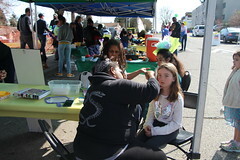 For each major development or renovation project, Seattle Parks and Recreation typically holds three meetings to ensure community involvement. The third meeting will be held in early October. In addition to the public meetings, Parks does other outreach for this project including attending monthly Vietnamese Tea for seniors and participating in an East African toddler storytelling session. Parks staff also took part in an open house event in the First Hill neighborhood to gather additional input for the park design. The Yesler Community Center has been a critical partner in gathering community input. Current Yesler Terrace residents have called the new park the “heart” of the community. 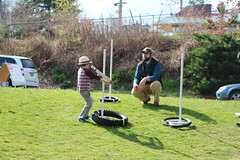 http://www.seattle.gov/parks/projects/yesler_terrace_park/ If you have questions, please contact project planner, Pam Kliment at pamela.kliment@seattle.gov or 684-7556. Seattle Parks and Recreation invites the community to provide input on the schematic design and concept alternatives for the Cedar Park renovation project on Wednesday, June 18, 2014 at 6:30 p.m. The meeting location is the Lake City Presbyterian Church at 3841 NE 123rd St., Seattle, WA 98125. Cedar Park schematic design was developed with input that Seattle Parks received at the first public meeting. The park is located in northeast Seattle at 3767 NE 135th St. on land leased from Seattle Public Schools. 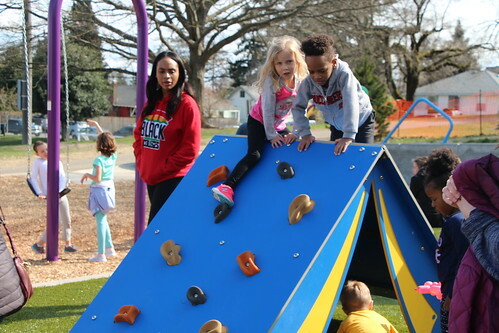 The park plans are being coordinated with Seattle Public School’s redevelopment plan to include a join-use playground/park feature with Cedar Park Elementary. Parks encourages the community to be part of the process and provide input on the project. The department will also obtain feedback from parents and teachers of Olympic Hills Elementary to assist in the design process of the playground and park for its community of children and families. The 2008 Parks and Green Spaces Levy allocates $500,000 to plan, design and construct the renovations at Cedar Park. If you have questions, contact parks planner, Jeron Gates at jeron.gates@seattle.gov or 206-255-4051. Seattle Parks and Recreation invites the community to a public open house on Tuesday, May 20, 2014 at 2100 Westlake Ave., on the northeast corner of Westlake Ave. and Lenora St., from 11:30 a.m. – 1:30 p.m. Seattle Parks is starting the design process for a new park in the Denny Triangle Urban Village Center. This meeting is an opportunity for community members to review project information, concept designs and provide input on the design of the park. In December 2008, Seattle Parks purchased the 8,722-square-foot site to fill a green spaces gap in the neighborhood. It is a “land bank” property being held in its current condition until funds to develop it become available. Funding is currently available to pursue a schematic design for the park but not for development. An alley exists between the park property and the adjacent tower development site. Parks is working with the adjacent developer to vacate the alley and bring mutual benefit to both parties. This initial meeting is an opportunity for the community to learn about the proposed project, the partnering for alley vacation, and to provide input on the park design. Parks will take additional input through a survey that will be posted on the project website by May 20, 2014, or the community can email the project manager directly. A second meeting for the park project will be held in June. If you have questions, please contact Kim Baldwin, Project Manager at 206-615-0810 or kim.baldwin@seattle.gov. Seattle Parks and Recreation invites the community to a public meeting on Thursday, May 22, 2014 from 6:30 to 8 p.m. at Mount Baker Community Clubhouse. Mount Baker Community Clubhouse is located at 3811 Mt. Rainier Dr. S. The community is encouraged to be part of the process and provide input on the park renovation project. At this meeting, Parks’ in-house landscape architect and project planner will gather community input to create a preferred design for the renovated play area. Mt. Baker Park is located at 2521 Lake Park Dr. S.
This project will replace play equipment, provide access improvements and improve other features at the park. 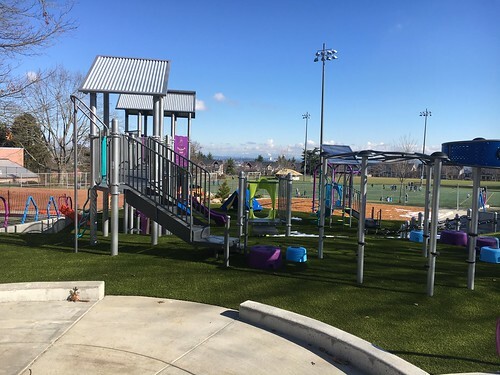 The scope of this project brings the play area into compliance with current play area safety standards and meets the requirement of the Americans with Disabilities Act (ADA). Monthly Vietnamese Senior Tea held at the Yesler Community Center, March 26, 2014. When Seattle Parks and Recreation Project Manager Pamela Kliment began conducting outreach for a new park in Yesler Terrace, she had to rethink her outreach strategy. After presenting the project at three different Yesler Community Council meetings, she often found that there were only a few English speakers in attendance, and some community members couldn’t read in their own languages. Shwu-jen Hwang and Frank Robinson are the designers for the project. Both are Seattle Parks landscape architects. Toby Ressler will be the project manager. They are working as a team to make sure the park design will meet the community’s recreation and gathering needs, and be suitable for cultural traditions and future uses. The team realized that if they were going to plan, design and build a park that reflected the people of Yesler Terrace and surrounding neighborhoods, they’d have to immerse themselves in those communities. During the last two months Kliment attended the First Hill Improvement Association Open House, and aided by interpreters, the monthly Vietnamese Senior Tea at the community center and an East African reading and singing event for children. Reading and singing time sponsored by the Seattle Public Library held at the Yesler Community Center, April 9, 2014. The design team faces a unique challenge because the park is part of the Yesler Terrace Redevelopment. Yesler Terrace is being redeveloped from a low-income housing development to a combination of low-income housing, market rate housing, offices and community spaces. All the existing housing will be demolished and the street grid will be altered. The designers must try to satisfy current residents, future residents, business people, children, seniors and all of their diverse needs. Yesler Terrace Community Council meeting April 15, 2014. According to a report conducted by Seattle Housing Authority, African Americans/Africans and Asian Americans/Asians make up more than 80 percent of the Yesler Terrace population. Additionally, the disability rate in the community is nearly 50 percent higher than the overall Seattle population, meaning almost one in five residents is disabled. “Yesler Park is the convergence point of many different cultures in a location that is close to downtown and is very connected to surrounding neighborhoods,” landscape architect Frank Robinson said. In addition to attending already established events to do outreach, the Seattle Parks team sent out mailers in five languages and put up posters in the neighborhood inviting residents to attend three public meetings and give input on the park design. The first meeting was held in late April and the other two are scheduled for June 26 and Aug. 28 at the community center. “Working with many different ethnic groups is very exciting and challenging, but we have found good ways to communicate with them and are very impressed with their level of engagement,” landscape architect Shwu-jen Hwang said. The park will be 1.7 acres and will be adjacent to the Yesler Community Center on the west side. The 2008 Parks and Green Spaces Levy provides $3 million for the planning, design and construction of the park. “The park is part of a changing community, and there are so many details to keep in mind,” Kliment said. Seattle Parks and Recreation invites the community to provide input on Magnolia Manor Park Improvements Opportunity Fund project on Thursday, May 1, 2014 from 6:30 – 8 p.m. at the Magnolia Community Center at 2550 34th Ave W.
This community-initiated project intends to implement a plan for opening up and improving the level areas of the park. Proposed work provides a second access and improvements to the P-Patch, improvements to the dog off-leash area, path and gathering areas along the north side of the park. Magnolia Manor Park is located at 3500 28th Ave. W.
The meeting will be an opportunity to hear about the proposed improvements, the project schedule and provide input. Planning, design and construction funding is provided by the Parks and Green Spaces Levy Opportunity Fund. The community is encouraged to attend this next step in the improvement project and provide feedback. For more information on the project please visit http://www.seattle.gov/parks/projects/magnolia_manor/ or contact Garrett Farrell at 206-233-7921 or garrett.farrell@seattle.gov.